Tokyo correspondent wanted! Readers in Tokyo, want to keep us posted on music making there? 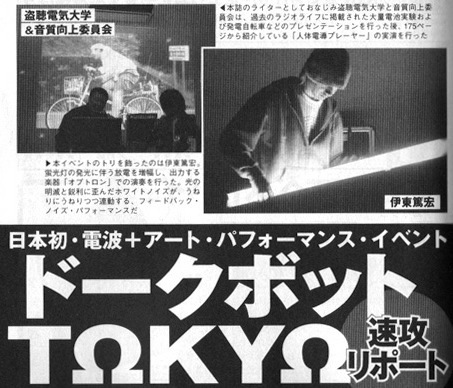 I’d love to have a CDM Tokyo writer, even if just to send us some Dorkbot Tokyo pictures next month. Drop me a line. What’s Dorkbot? Dorkbot is “people doing strange things with electricity”; it’s an event that was born here in NYC (at Columbia) but has now spread to many corners of the world. Check the international Dorkbot site, find a Dorkbot, go listen/see/present, and send photos and a few words = instant global fame on CDM. Even if you’re not in Tokyo.